This man is my hero. I could talk all day long about the incredible things he is doing to save a species from extinction. With almost no financial subsistence Tokkie flies daily doing anything he can to help rhinos. From working with vets to deliver orphans to rehabilitation centers to communicating with anti-poaching units on the ground and relaying an aerial persepctive of the direction poachers are moving towards. Tokkies bravery and heroism is unparalleled and I truly feel honored to call him my friend. But... Enough of me talking. Let's hear in his words what daily life for him is like. You are a successful businessman and could sit back and let someone else deal with the epidemic of rhino poaching. Why have you decided to invest so much of your own time and money into trying to save rhinos from extinction? We have got to do it. 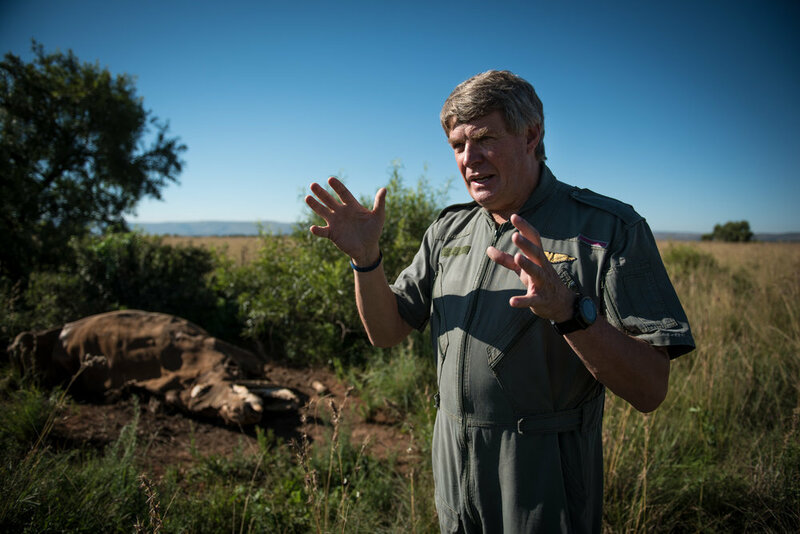 It is our job to save the Rhinos. When you go to bed at night, you must ask yourself, what have I done today to save our heritage, our animals? It is a responsibility, it has got to be done. I love doing it. 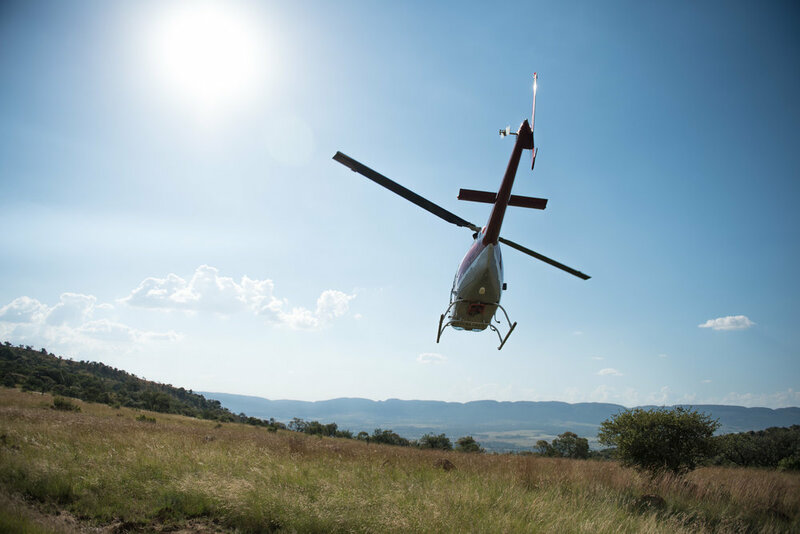 As an accomplished helicopter pilot and the owner of your own chopper, you fly almost daily to provide surveillance from the air, fly anti-poaching rangers to hotspots, help vets access remote areas to tend to wounded rhinos and orphaned babies, what has been your most harrowing experience so far? I went to Malawi last year for African Parks, we were flying for elephant anti-poaching and while we were flying there, overcast, rain, mist, flying for over 7 and a half hours over dense bush and you think to yourself, "Why am I doing this? I am in a foreign country, I don't know where I am going." But you have got to do it and when you get back, you know why you have done it, because you have achieved something again. I don't live in fear, and like I said, it is all of our responsibility. I love doing this. On several occasions, you have had to fly orphaned baby rhinos to facilities that can take care of them. Explain how you accomplish such an amazing feat and not put yourself, your chopper or the orphaned rhino in jeopardy? It is by the experience of doing it. You have to understand your machine and understand what the capabilities are and you make a decision. Should I fly? Should we get a transport and take the Rhino by road? When you see the severe conditions faced by these animals, you just have to make the decision and say, "I will lift this baby up by the machine and take it wherever it needs to go." You are one of the unsung heroes of rhino protection and conservation. The Wildlife Defenders describes you and many others who are fighting this war as ordinary people doing extraordinary things to protect and defend rhinos from extinction. What issues do you believe the world needs to know to win the war? Awareness is the biggest issue. I think the public is not aware of how the Rhinos are being slaughtered up and down Africa. If you don't see it you will never know or never understand the seriousness of it. You can't describe it to somebody, we see it every single day, and people don't realize the magnitude and the inhumanity of what is happening. We have to let them know what is happening so they can understand the gravity of the situation and how they can help to get the Rhinos saved. For more information on Tokkie's foundation PLEASE check out www.fffsa.com. We set up The Wildlife Defenders to recognize those doing amazing things for conservation and our planet. If you feel the urge to donate to a charity I cannot recommend Flying for Freedom enough!! !